St. Paul urged us to give thanks to God always. Our forebears and our founding fathers, active Christians, often followed this sage counsel. And eventually our national day of Thanksgiving evolved. The very first Thanksgiving was celebrated on September 8, 1565, in what is now St. Augustine, Florida, by Spanish settlers and Timucua Indians. On that day the first Mass, an act of thanksgiving, was celebrated on American soil, and it was followed by a feast of bean soup. Another Thanksgiving was observed in El Paso, Texas, under the leadership of Spanish explorer Don Juan de Onate, who declared: “In the name of the Most Holy Trinity…I take possession of this whole land this April 30, 1598, in honor of Our Lord Jesus Christ, on this day of the Ascension of Our Lord ….” Mass was celebrated and a feast of geese, cranes, and ducks was enjoyed by the colonists, followed by a play organized by the Franciscan missionaries honoring the Native American converts. previously been captured and enslaved by the English, but was freed by the Spanish Franciscans, and was baptized a Catholic. Thus, a Catholic contributed to arranging our Thanksgiving Day. Thanksgiving is one of the most loved and honored American holidays. Some travel considerable distances to spend this day with family. Spending time with family is surely a special blessing. But it is important to remember that Thanksgiving is much more than turkey, stuffing, and football. Unlike other secular holidays like Labor Day and the Fourth of July, Thanksgiving is a national holiday that is clearly religious in nature. As a nation of faith with Christian foundation, we set aside this day to thank God for his many blessings. In 1815 President James Madison issued a proclamation for “a day of thanksgiving and of devout acknowledgements to Almighty God for his great goodness.” But after Madison Thanksgiving reverted to a regional celebration in the New England states for 48 years. Thoughts to ponder this Thanksgiving. Thanks be to God! This Sunday is the First Sunday of Advent. As is my personal tradition, I like to make Advent resolutions in anticipation of the birth of the little baby Jesus. - abstain from frivolous entertainment (or at least cut back on them considerably). This means, less time playing games and watching certain TV programs that I really like. - not fall into the trap of having to compete with the crowds for finding that special gift. I will also put myself on a budget. - pray more, talk less. - make the special feast days that fall within the Advent season, more special, especially the Feast of the Immaculate Conception and Our Lady of Guadalupe's Feast day. - try to make frugal meals as a small sacrifice for those who do not have enough to eat. - remember the less fortunate, either by prayer or in some concrete way. - spend quality time with the family in the evening when we light our Advent candles, read from our Magnificat's Advent Companion. - make a supreme effort to conquer my faults. - forgive anyone who has hurt me and reach out to anyone I may have hurt. - hold off on trimming the tree and putting out the other Christmas decorations until the last week of Advent. - not open any Christmas card until the last week of Advent. - spend quality time with Jesus in Adoration. - smile or greet anyone who looks sad or lonely. - make it a point to be still and not fall into the frenzy of the worldly Christmas spirit but be more reflective in the spiritual Christmas spirit. - give a gift to someone who isn't expecting anything and who cannot reciprocate. - watch spiritually uplifting programs and movies, including childhood favorites like the Little Drummer Boy, A Charlie Brown Christmas, and How the Grinch Stole Christmas so that I can relive the magic of the Christmas anticipation when I was a young girl. 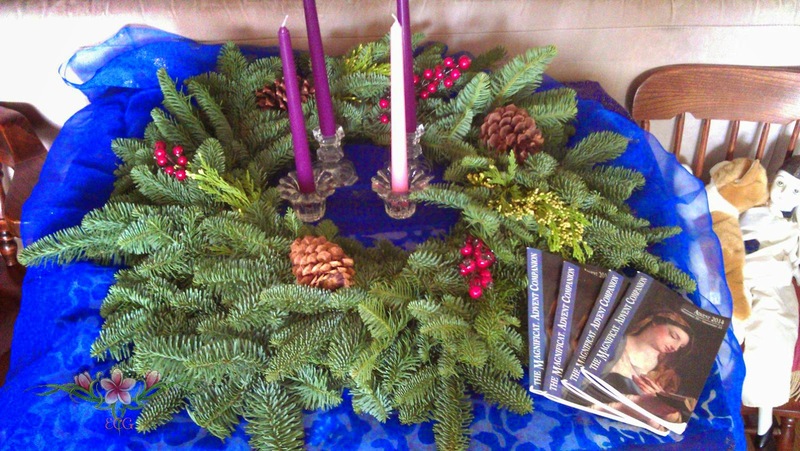 - sing Advent hymns and carols.